The Design of Understanding asks the question: what does it mean to understand in a postmodern world? An age where Truth with capital T has disappeared, where the big narrative has been replaced by 140 character sound bites and where systems of flow have become the preferred model of understanding the world. And where, on top of all this, digital technology provides us with a maelstrom of data but where tools to play and make sense of these facts are still few and far apart. To think in systems means to focus on the relations between nodes. We can see the world, for example, as a flow of people (or smaller groups like consumers, managers and service providers), of money, of information, of goods, of regulations and even of ideas. To choose which relations to map depends on our question and our expected outcome. Even when we use adaptive systems as a model of understanding the world, we still haven’t escaped our age-old problem: no matter how hard we try, no matter how much data we collect, we must choose what to put in and what to leave out. By picking one flow over another, we remain haunted by the feeling that there could be another, a better way of understanding the world just beyond our reach. To design for understanding is then to create tools and methods that can be used to work one’s way through the world, to enable people to find that brief moment of clarity they need to take the next step. Our current phase started around 2005, where underpinned by science we discovered that we are matching patterns not against the best, but against the first pattern we can think of. We build this library of patterns from stories our friends share, from newspapers and TV and from snippets of conversations we overhear in the corridor. What makes things complicated for companies is that it turns out we learn more from stories of failure than those of success. Tony’s slides can be found here, for a deep insight in the theory have a look at this. What surprised me in David’s work as SciFi UI designer was hearing about the amount of physical work that is involved in building sets for science fiction films. I’d expected that by now all SciFi films were completely created in 3D software but it turned out that in a film like Prometheus most of the interiors were actually build in the studio. The benefits, as David stated, are numerous: “the director of photography can exactly see what they will get, actors can now see what they can touch” and as a designer “instead of figuring things out in post production, you can build up some rationale” of how your interface should work. A second gem was that even for fictional interfaces they use as much real world inspiration as they can find. For the dashboard of Prometheus they mixed the shapes of coral reefs, with weather maps and data from NASA. Provided a great list of works he found interesting from the last years. The challenge that Andy highlighted was that the possibilities of building tools for visualising complex data are constrained not by what can be imagined or created, but by what can be made understandable. Things become interesting when you can convey an emotion and tell a story. The once sleep-inducing TV broadcasts of Great Britain’s sail team in the Olympics were revolutionised by infographics on TV. It’s a great example of how successful information design can change a whole game. Another interesting development are experiments with data visualisation tools that go beyond the visual. 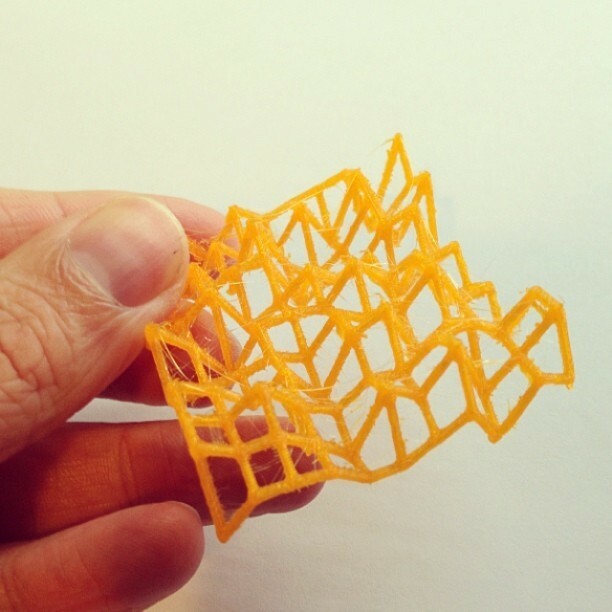 One example is the work of Brendan Dawes, where he used a 3D printer to spatialise and compare his Twitter usage of 2010 and 2013. Jo showed the benefit of a good story. Her product, a posable doll, became the example for newspapers to explain what 3D printers could be used for. After Wired magazine wrote an article about them, the first 100 sold very quick. After that came the hard work of finding ‘real’ people, not only nerds to sell the product too. She also shared the story that to understand the inner workings of a system you need perseverance to keep on working on figuring things out. She said: “being first is hard, building something with moving parts is even harder.” Their customers started to complain about the joints that wore out after extensive use. It turned out that to fix this problem they had to talk to an an awful lot of people and only after 5 months, almost by pure chance, they stumbled upon someone who knew the solution to having moving parts that don’t wear out with excessive wear. Started off strong by stating: “we have a poor set of tools and language to understand new systems” the lack of tools and language make it very hard for designers to design for understanding. The approach that he perfected was to understand things by making them tangible. He shared a wonderful concept of an answering machine video and some sketches of students who used kitchen utensils to explain the inner workings of a video recorder. Based on these tangible models you can redesign the interface to provide the details that allow people to come up with a mental model of how to understand the system. Durrell Bishop Marble Answer Machine from Luckybite on Vimeo. What I felt after this talk is that in the 21st century we’ve lost touch with our tools. Now that software is eating the world, the stories we once used to make sense of the world are no longer sufficient. The great work that designers did in the 20th century —typography, grids, colour theory and composition— now seem entirely unequipped to provide people with a sense of understanding of the tools created in this century. And we need to work hard on methods of explanation like animations and interactive application to provide people with an understanding that they’ve since then lost. Matt stated that: in a responsive age of mobile, laptop and tablet, combined with Twitter, Facebook and Tumblr, comics have to adapt. Where once the page was fundamental element, now it has become the panel. There are four strategies that comic makers can use: one is to pretend nothing is happening and to hide in comic book stores and wait until the digital wave is over. Another is to tread the web as a page, like the XKCD comic, when you reduce your comic to the size of one frame it will work in almost any circumstance. The next is a labour intensive way: create a different solution for every format, have a Tumblr, a Twitter and a Facebook comic. And the last one is to see the internet as a new playground, have stories move from one size to another, from Twitter to Facebook to printed pages. Sadly it turns out that internet is not as permanent as once believed. The reality is one of dead URLs, lost pages and broken stories. His advice then was to act like the old days and encourage every user to start building their own digital attic of the internet. Those who stated that newspapers and magazines are doomed group too much together. If we see a newspaper as a fast-moving system to put images and text together, it’s clear that the internet can do this much better. Magazines, however are a much more sophisticated way to combine the two. Pushed by lower printing cost and easier ways of designing and collaborating, we are witnessing the rise of small magazines such as Apartamento, The Ride, Reportagen, Root+bone, Alpine review, Offscreen and even The Long Good Read a collaboration between The Guardian and The Newspaper club. They are not trying to compete with the internet but focus on their strength of monthly and quarterly publications. The news system has become dysfunctional; through a combination of mobile, social networks and an increasing time pressure, it has become an “ephemeral media.” Whereas old news sites would get their visitors first from portals and later from search engines, a site like Buzzfeed gets 75% of its visitors from social media. However, there is hope. When sharing, people do not mind lenght so much, both short and long stories are happily shared, the only thing they actively avoid is sharing a story without a concrete pay-off. Both shorter and longer stories do well, it’s the length of 500-800 words where you don’t want to be. As a result of this social media sharing boom news has become both a lot shorter like Circa, Buzzfeed, UsVSth3m and 15 seconds and much longer, like Snowfall, Matter, Long Reads, Narratively, the slow news movement and the success of crowd-funded news site De Correspondent. Not only have many new parties joined the news landscape also the articles themselves have become more a mix of writings, visual, and data journalism. In the end people in large organisations, even those in charge of finance, are still people. You shouldn’t be distracted by bureaucracy, by numbers or by what branding specialist tell you, but instead focus on the ancient art of making great products. The Design of Understanding has become one of my favourite conferences and a great way to get through the cold January month. I’m already looking forward to the 2015 edition. and you can still read my 2012 and 2013 review.